The text comes in at 9:45. I smile and tap out, “Yes, please!” A few moments later the phone rings and I close my door to talk in a hushed voice with my boyfriend (I can’t tell you how strange it still is to use that word, it makes me feel like I’m fifteen). We start to talk about our days and about how we miss each other. Because, you know, it’s been a whole 36 hours since I saw him. Then, “I think I hear footsteps. Just a second.” Greg puts his phone down and I can hear a muffled conversation going on in the distance. Five minutes later there’s a knock on my door. I have a child who’s uncomfortable with a loose molar; he fears it will fall out while he’s asleep. “Greg, hold on just a minute, I’ll be right back.” Hugs and consolations given, I return to my adult conversation. “So sorry, loose tooth emergency.” And then we laugh. For the past four months I’ve been exclusively dating an absolutely incredible guy who happens to be a divorced parent like I am. We each have exes and parenting schedules and cars big enough to haul our crews and their associated stuff. Thankfully we have our children on the same weekends because clearly it doesn’t work to have opposite schedules, and we get several weeknights each week to ourselves, as well, which has been instrumental in having time to get to know each other better. I have only about a year of experience dating as a parent, and this is the first time I’ve been in a relationship since my divorce, but it seems like dating parents start to think into the future more quickly than people without kids. – It’s harder to justify spending time with someone who’s just “meh” when you have kids. If I’d been a rebellious teen (I was not) I might have thrilled over meeting a bad boy and watching my parents disapprove. But with little ones at home I had to ask myself, “Would I feel comfortable with my kids meeting this guy someday?” and if the answer was, “Um, no,” then there wasn’t much point keeping on. – When you meet someone who also has kids, you immediately add up how many children you have combined. Then freak out because you realize that if things work out really well you will need an obscene amount of bedrooms and garage space. And then you calm down because it’s too early to worry about that anyway. Right? Or is it? People can and do turn down dates and relationships with people if the number of children involved exceeds a certain number. – With children, the future is never going to be carefree and spontaneous. You CAN both pick up and move to New Zealand, sure, but your kids likely wouldn’t be coming along in that scenario unless both other parents agree to the relocation, which makes it completely impossible. You can limit yourself to dating only people who live in your neighborhood, or realize you’ll be dealing with different school districts and parents who might live in four different cities and work in yet another four separate towns. – By the age of 40, most people have exes to deal with, that’s just the way it is. But without kids in the picture, those exes can more easily stay out of sight. When you’re co-parenting, the ex’s name may be brought up in conversation every single day. The ex may be texting your boyfriend during your date night to ask when she can drop off things at his house for the kids. Greg’s ex is… controlling, to put it mildly. When I think about how much I love being with him I have to realize that means I also have to deal with her presence. For now it’s just by association, but, again, thinking further ahead than necessary, some day it’s possible I’d meet her and we’d be part of each other’s lives. Premature future-glancing aside, there are also the kids. 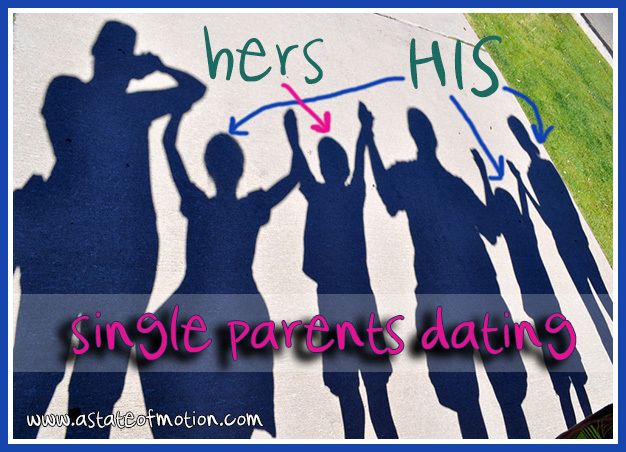 Specifically, when do you introduce the kids to your new significant other? Though Greg has been divorced much longer than me, his children had never met anyone he’d previously dated. My kids hadn’t met any of my short-term suitors, either. So neither of us really knew the right answer. His kids found out about me relatively quickly – they’re more savvy and perceptive about those things than my children and had seen my name pop up on his phone, so they confronted him. So when I met them, it was because Greg wanted to remove some of the mystery they thought surrounded me, and they knew I was his girlfriend. My kids, on the other hand, have seen Greg about four times now and I’ve only called him my friend. I think they suspect he’s more than an acquaintance, but so far none of the kids has asked that specifically, and I’m okay with that. Greg has said he wished we’d met each other before we had kids, because things would have been simpler. This is true, but we weren’t the same people before our marriages and the time may not have been right then. Plus I’d not have my children, and I wouldn’t trade them for anything in the world, not even for a divorce-free past. I have no answers – like I said, this is all new to me and I’m fumbling along with Greg trying to figure out not just what’s right for us but what may, at some point, have to be right for our children. But, oh… complexities aside, it sure is awesome to be in love. Silhouette family photography by Carissa Rogers used under creative commons license. It is awesome to be in love! I so loved reading this post, and I’m so happy for you! Your blog has been one of a couple of blogs I have read religiously since my separation a year ago. When is the right time for the boyfriend to meet the kids…good question..I too was certain that my kids wouldn’t meet anyone I was dating until I knew it was absolutely serious and the guy would be in the picture for quite some time (because I still can’t believe in ‘forever’ anymore! )…well anyway, my savvy 7 year old quickly realised that my ‘friend’ Michael was someone more than that because he gave me flowers, and he overheard his dad mention ‘Michael’ to his girlfriend…so my 7 year old came home one Saturday and politely demanded that he meet Michael that weekend! HIs reckoning was he knows his dad’s girlfriend, and so wanted to meet my boyfriend! Michael and I had only been seeing each other for a month, and had only agreed the week before to not see other people. Yikes! It was still incredibly early! So Michael met my kids a good couple of months before I would have wanted it, but luckily it went well! I’m so glad you found something good in my blog! I always appreciate your thoughtful comments. So glad you’ve met someone and that meeting your son went smoothly! SO happy you have met a great guy! Yes, it’s soooo much more complicated with children and exes that WILL be a part of life from this time forward. It’s all possible, but the simple bliss is non-existent. I’m glad you have found someone and time will reveal how well things work to mesh your lives. Time is the best thing for everyone involved. I think you’re wise to glance ahead to a possible future. If you come to a place where you know that isn’t a future that would work for you and your children, you will know how to steer the present. Go for it! Hi! Not stalking-just dropping by to see how things are going! I feel as though I could have written your blog post…it’s very reassuring to hear that other divorced single parent couples are experiencing the same insecurities, doubts, what ifs, and practical woes (scheduling). I’m still in the middle of my divorce, but I’ve met the most wonderful single dad who has been divorced for many years. Being in love is great, but it’s so much scarier than it would have been before marriage/kids. There’s just so much more to lose now, so many lives are involved now. I look forward to reading more about your relationship as I hesitantly navigate my own.